The survivors barricade a bay window with plywood, an old armoire, an empty refrigerator and it is dark enough within to read by candlelight. Through a crack you can see two eyes and a mouth in shadow and a night filled with intent, glittering teeth. 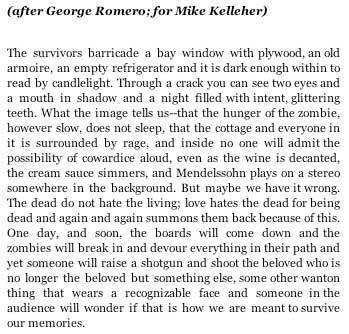 What the image tells us–that the hunger of the zombie, however slow, does not sleep, that the cottage and everyone in it is surrounded by rage, and inside no one will admit the possibility of cowardice aloud, even as the wine is decanted, the cream sauce simmers, and Mendelssohn plays on a stereo somewhere in the background. But maybe we have it wrong. The dead do not hate the living; love hates the dead for being dead and again and again summons them back because of this. One day, and soon, the boards will come down and the zombies will break in and devour everything in their path and yet someone will raise a shotgun and shoot the beloved who is no longer the beloved but something else, some other wanton thing that wears a recognizable face and someone in the audience will wonder if that is how we are meant to survive our memories.